Baby’s first dental visit is recommended as soon as the first tooth erupts or no later than their first birthday. The first visit is the first step in creating a dental home. Parents will learn what to expect during teething and dental development and your baby will be introduced to the dental office. Dr. Michelle will create an individualized cavity risk assessment and discuss how to keep your baby’s teeth and gums healthy. 1. Clean baby’s gums with a soft toothbrush or gentle cloth. 2. 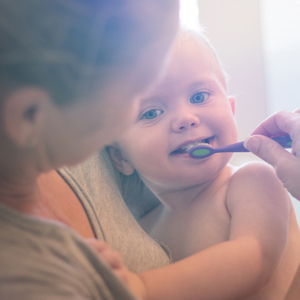 Begin brushing baby’s teeth with a toothbrush as soon as the first tooth erupts. 3. Avoid putting child to sleep with a bottle containing anything other than water.